As a continuation of Sharing: It's Not Influence, Part 1, it may be worthwhile to begin where we left off, with a parent of a child. Children are wild cards. The relationship between a parent and child, in terms of how influence works, ebbs and flows over the course of a lifetime. It is not defined by any single action. It is not patently obvious when it occurs. It is not even necessarily predictable by any measure. A parent, for example, might be able to order a child to brush their teeth one night, and some people might argue that is a form of influence. However, real influence takes shape over the long term and not by a single action. 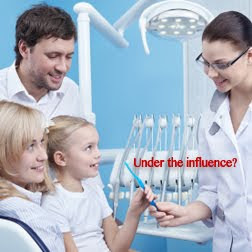 Real influence might manifest in a child becoming someone who has exceptional dental practices, assuming we could isolate the influences (which we cannot). Even a persistent parent — one who insists on dental hygiene, one who provides proper role modeling, one who nurtures and educates — may not be the most influential in person in terms of dental hygiene. It could just as easily be the dentist, dental hygienist, grandparent, sibling, friend, associate, television program, personal experience, education, or more than likely — some collective of all these people and things, with each contributing some unknown percentage of influence. On the other hand, a persistent parent — one who does everything mentioned above — is equally likely to produce a child who does not exhibit exceptional dental practices. In fact, they are just as likely to produce a child who hates dentists, seldom brushes their teeth, and consumes more than their healthy share of snacks, sweets, and soda pop. What's that about? In this case, the parent may have no real influence, despite their proximity to the child. Or, conversely, everything that the parent contributed could have influenced the child after all, but in the opposite direction. Or, you never know, the parent may have had influence during a certain period of time, but then this influence lost out to other people or experiences. Confused yet? You ought to be. Outside of providing a definition of influence, no one knows how influence works. Most of the time, people do not even fully understand what influences them — let alone other people as a temporal contributor to someone's decision-making process. Sure, we have some broad brush notions — reciprocity, commitment, social morals, preference, authority, scarcity — but none of those include mere persistence. The truth is we really know next to nothing about influence, which is why it makes life interesting. Three factors that make influence infinitely complex. 1. Attention. Marketers invest most of their time on attention. There is some truth to the notion that you cannot form an opinion about something you don't know exists. This is where reach (eyeballs), frequency (impressions), and authority (perceived expertise) count somewhat. The challenge, however, is to remind marketers that every impression doesn't count as 100 percent attention; most impressions capture a mere fraction of our attention, especially online. There are so many things competing for our attention, all of which are being filtered by arbitrary and random conditionals. And even then, this assumes we are online as our streams chug along. 2. Receptiveness. Marketers don't seem to care much about receptiveness. Most assume that everyone is interested in their product, service, or position. They assume their message is important. And they assume you care, doubly so if chance and circumstance have happened to bring you together for some reason. They could not be more wrong. To be open to a message, people generally have to meet a select number of conditions that vary from person to person. They have to be interested, attentive, in a good mood, open to a new opinion, and in the market for whatever you're peddling. Most have a hard time comprehending that such periods of openness are subject to varied and limited amounts of time. 3. Collectiveness. Influence doesn't happen in a vacuum. Most marketers and measurement systems treat actions as if they happen in an isolated one-on-one setting, without ever considering that multiple messages, people, and experiences all contribute to our world view. Equally important, any one of them could support or detract from anything. Consider the composite of almost any decision you make. Even when we don't consciously consider it, our brains have created a complex composite of stuff that we apply to any number of circumstances: subconscious memories, past experiences, personal values, personality types, current events, advice from authors, opinions from family, preferences of friends, insights from opinion leaders, etc., etc., etc. Depending on the person and their individual relationship to all of these people and things and perceptions, the whole of it will weigh on any decision. And chances are, we aren't even aware of it. Claiming to understand influence is the biggest snake oil game ever. This isn't an attack on marketing or measures. It's more of a testament to human social intelligence, for all its strengths and weaknesses. We cannot be read so easily, even in various groupings. This also doesn't necessarily preclude marketers from making educated guesses. We do that all the time. But for anyone to say they understand influence so thoroughly that they can entice people to do anything online is a different kind of disposition. It also shows significant shortsightedness, because surely if you could read people down to the click predictability and purchase probabilities, the financial sector — specifically the stock market — would be a better match. At minimum, such talents would preclude asking for hourly rates or retainers. A mere fraction of a percent of the profits would be enough. Making G+uru: Get Certified Now!